All interested parties are invited to the weekly Algebra Seminar, held each Friday at 2PM in 353 RSS. 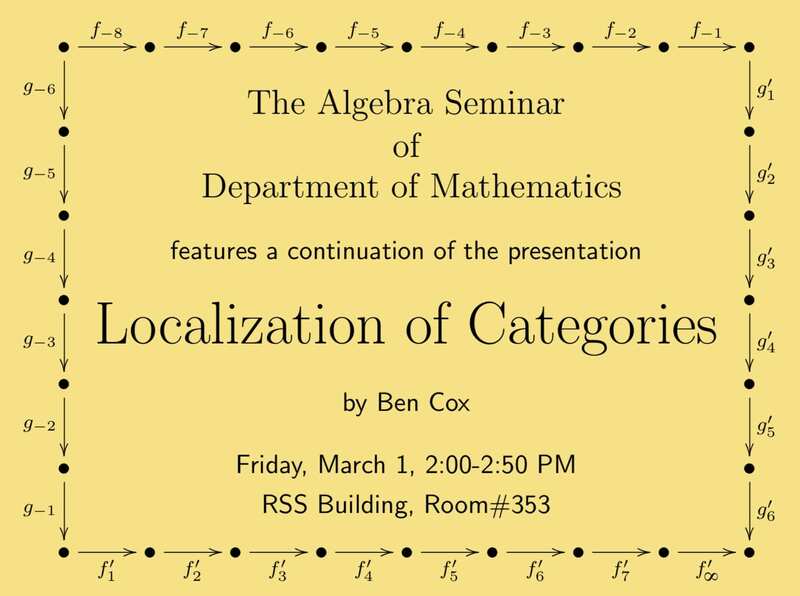 This week’s seminar features Professor Ben Cox lecturing on the Localization of Categories. 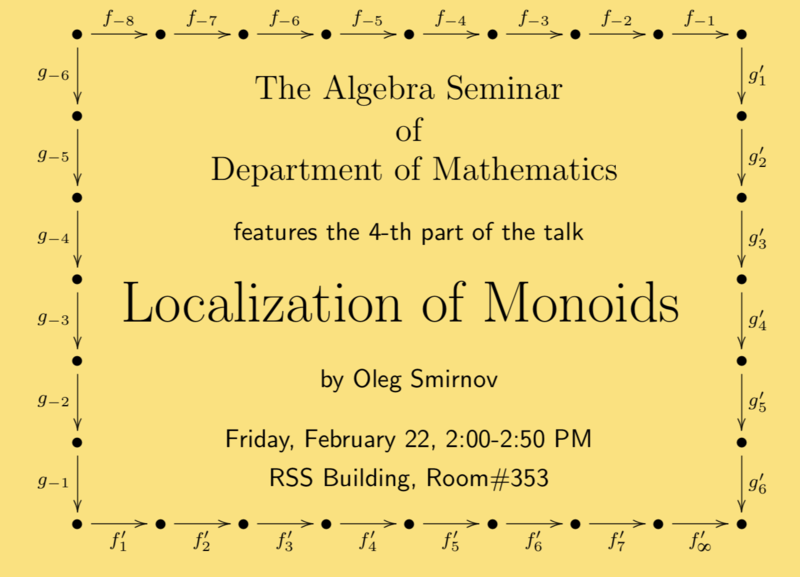 For more information, contact Oleg Smirnov (smirnov@cofc.edu). 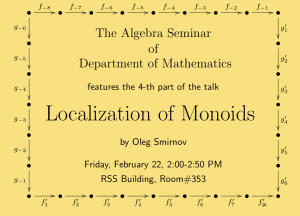 Although there will be no departmental colloquium this week, the CofC Math Department’s Algebra Seminar will be meeting on Friday February 22nd at 2PM in 353 RSS to hear the finale of Oleg Smirnov’s four part presentation on the localization of monoids. 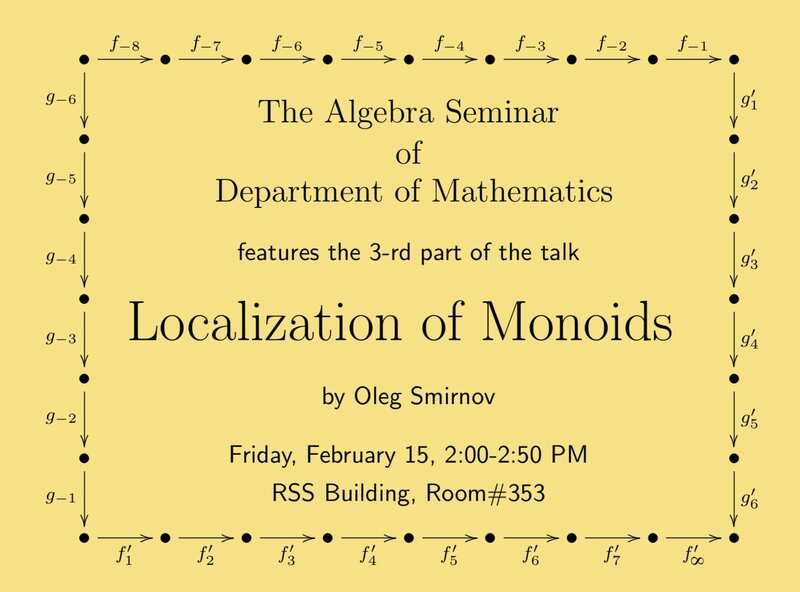 Please join us for the algebra seminar at 2PM on Fridays in 353 RSS. 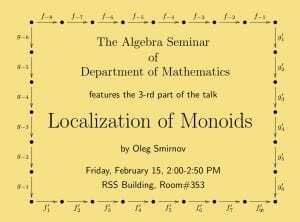 This week, on Friday February 15th, Oleg Smirnov will continue speaking on Localization of Monoids. For more information or to sign up for e-mail announcements please contact Oleg at smirnov@cofc.edu. This week’s math colloquium by Victor Moll of Tulane University on Some Questions Coming From the Evaluation of Integrals will be suitable for undergraduate and graduate students. The 2018-2019 academic year marks 100 years of the College of Charleston cultivating exemplary women leaders across disciplines. 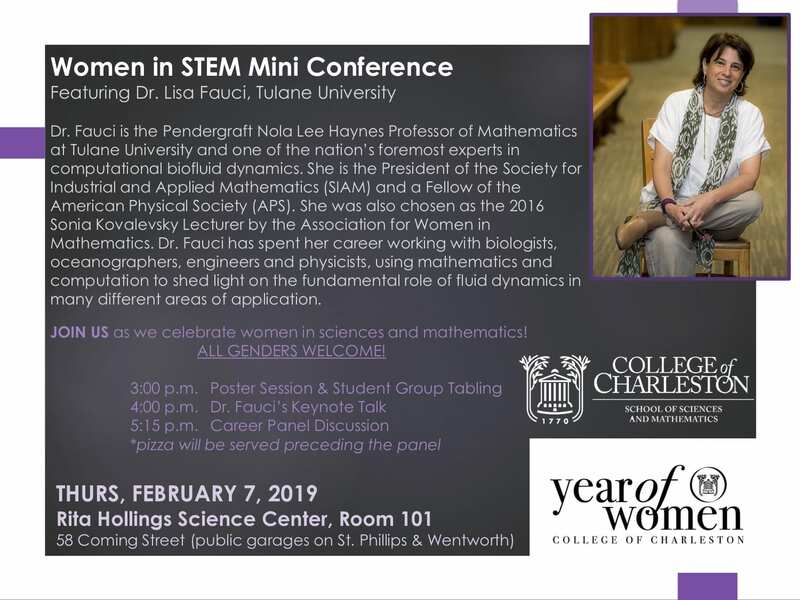 The School of Sciences & Mathematics is joining the celebration of those women, and the first admission of women to the College, by hosting a mini conference on Thursday, February 7, 2019 in the Rita Hollings Science Center, room 101, to celebrate Women in Science. The afternoon will consist of research presentations, a keynote talk, a pizza dinner, and a career panel discussion. Dr. Lisa Fauci is the Pendergraft Nola Lee Haynes Professor of Mathematics at Tulane University and one of the nation’s foremost experts in computational biofluid dynamics. She is the President of the Society for Industrial and Applied Mathematics (SIAM) and a Fellow of the American Physical Society (APS). She was also chosen as the 2016 Sonia Kovalevsky Lecturer by the Association for Women in Mathematics. Dr. Fauci has spent her career working with biologists, oceanographers, engineers and physicists, using mathematics and computation to shed light on the fundamental role of fluid dynamics in many different areas of application.